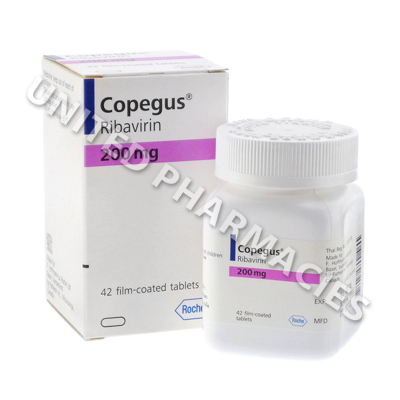 Copegus (Ribavirin) (also spelled ribavirin) belongs to a group of medicines known as nucleoside analogues, and it is used as a treatment for chronic hepatitis C.
Copegus (Ribavirin) (also spelled ribavirin) belongs to a group of medicines known as nucleoside analogues, and it is used as a treatment for chronic hepatitis C. Doctors prescribe it for use alongside peginterferon alfa or interferon alfa, as it is not effective if used on its own. This drug can help contribute to a reduction in the amount of the hepatitis C virus in the body, which in turn may reduce damage to the liver, while also improving its function. Your doctor will provide clear dosage instructions to you when prescribing Copegus (Ribavirin). As it must be used with an interferon alfa product in order to be effective, your doctor will provide you with dosage instructions for all of the medications you need to take, and will also tell you which other medications you need to take. The exact dosage can vary, and the prescribing doctor will need to take various factors into consideration, such as the patient's weight, medical history and the seriousness of the condition. Report any side effects you experience to your doctor. In some cases, serious reactions may occur, and this will require immediate medical care. Possible serious reactions include bloody diarrhoea, dark discoloured urine, depression, increased sensitivity to cold, problems related to vision, as well as other side effects which have not been listed here. This medication may harm or cause death to an unborn baby. This may occur if it is taken by a female patient who is pregnant or becomes pregnant, or if it is taken by a man who fathers a child while taking this drug. Two forms of birth control should be used while the drug is being taken, and for a period of at least 6 months after finishing treatment. This drug is not suitable for patients with specific types of heart disease, as it may cause anaemia and other severe complications. Patients with a history of heart problems must tell their doctor before taking this medicine. Always use Copegus (Ribavirin) as you have been prescribed by your doctor. Never self-medicate or change your dosage without first consulting your doctor. The correct dosage can vary depending on your health, medical history, and the severity of the condition being treated.